"Ruth Travis accepts Will Mayo, and Al Stevens, his rival, experiences the pangs of disappointment not unmixed with jealous rage. His feelings affect the beclouded brain of his half-witted brother, Ralph, who plots to avenge the brother he adores. Ruth comes to the sawmill, which Mayo owns, looking for her fiancé. It is Sunday afternoon and the place is deserted - save for the half-wit, who has a habit of prowling about alone among the machinery and timber. He sees Ruth and, prompted by a criminal instinct working blindly in him, seizes the girl and binds her to the log carrier. The whirring machinery is set in motion and the jagged teeth of the mammoth saw gnaw their way nearer and nearer. Mayo hears the dull buzzing of the giant saw, and hurries to investigate. He reaches the mill just in time. Frozen by horror, he yet forces himself to act, and, stopping the machinery, drags from the death rack the half unconscious girl." "The half-witted brother of the man whom Ruth Travis rejects binds her to the long run in the sawmill owned by her fiancé and sets the giant saw in motion. She is saved from a horrible death by her lover, who arrives in the nick of time." 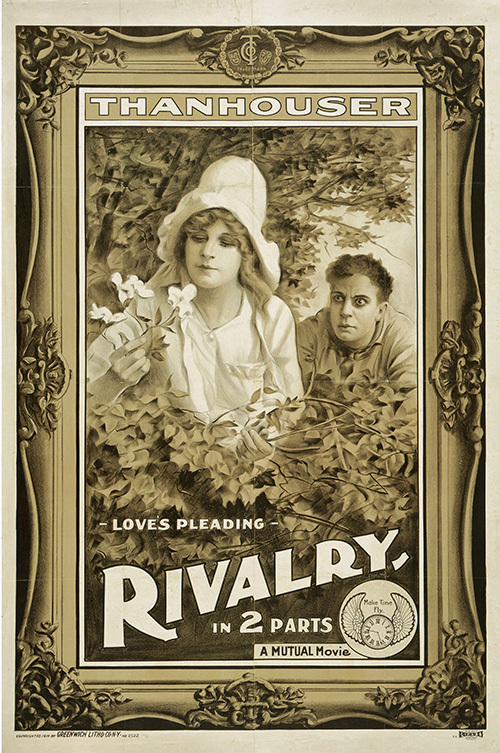 "The grand climax in the old reliable Blue Jeans [Ed note: a well-known stage melodrama], in which a pretty girl is snatched from a horrible death just as she is about to shoot into the greedy saws at a lumber mill while strapped to a log on the carriage, has been carefully dusted off for presentation in this two-reeler. The way which the big scene is made to fit is not as clear as it ought to be, but the production has so many good points that it will prove acceptable on almost any program."